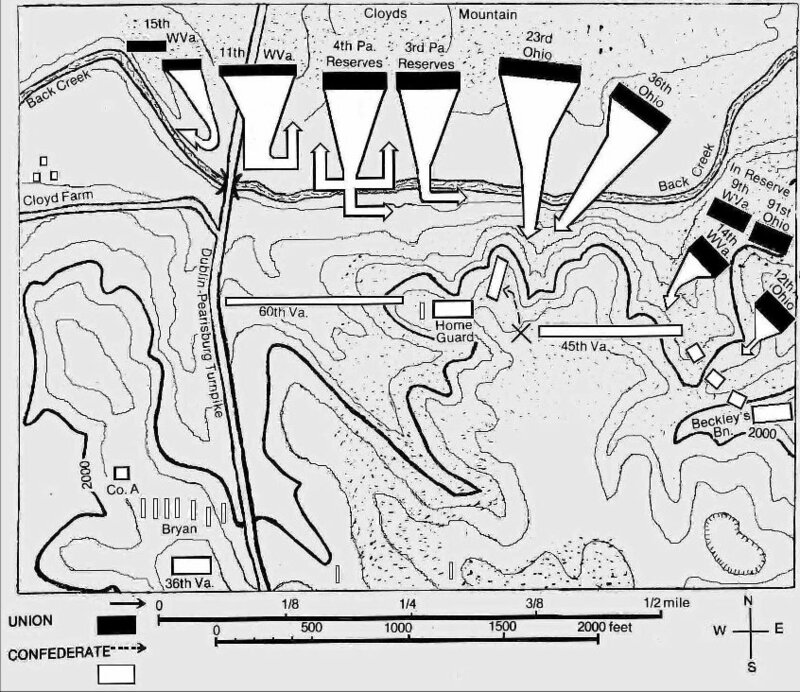 The battle of Cloyd's Mountain was overshadowed by the Wilderness, fought at around the same time, and was largely forgotten until recent times. Even the location of the fight was forgotten! Howard McManus decided to research this campaign and battle for this master's thesis under Dr. James I. Robertson at Virginia Tech. His thesis has been published as "The Battle of Cloyds Mountain, The Virginia and Tennessee Railroad Raid," and is available from his antique dealership, The History Broker. He has been kind enough to let me use his maps for this page. The battlefield is on private property. Gen. Grant, when planning his offensive of 1864, wanted to put as much pressure on the Confederates as possible, and in as many places as possible. Meade's Army of the Potomac would strike Lee while Butler advanced on Richmond, and Sherman advanced on Atlanta while Banks made a foray up the Red River. In Virginia, Sigel with 6,000 men would advance up the Shenandoah Valley to Staunton and take Lynchburg if possible. A small diversion would be made at Lewisburg. William Averell with 2,000 men, mostly cavalry, would raid Saltville in the southwest, one of only two salt producers in the Confederacy, and move east, raiding the Virginia and Tennessee Railroad and the lead mines near Wytheville. He would link up with his superior, George Crook with 6,000 men, who would raid the railroad bridge over the New River at Central Depot, now Radford. Combined, Crook and Averell would then move to Lynchburg and link up with Sigel. Operations this complex rarely work out according to plan, and this raid would be no exception. The Confederate reaction to the Union offensive was confused. Lee ordered Gen. Breckinridge, the Confederate commander in southwest Virginia, to move 4,000 men from southwest Virginia to meet Sigel in the Shenandoah Valley. Breckinridge would defeat Sigel at New Market on May 15th, but the defenses of southwest Virginia had been severely weakened. Brig. Gen. Albert Jenkins was left in command of southwest Virginia with just 4,600 troops. McCausland's Confederate brigade had been in a good position to block Crook as he advanced on Princeton, West Virginia, but McCausland was ordered to Dublin to entrain for the Shenandoah. Reaching Dublin late on May 6th, McCausland began to entrain, but was then ordered off the train to remain in Dublin, where he camped that night. Ringgold's battery was shanghaied from rail travel and sent north to confront Crook. The Home Guard of Christiansburg was called out, and these men and all other available troops were also sent north from Dublin to stop the enemy. Locals, including the Home Guards, believed that the gap through Cloyd's Mountain was the ideal place to block Crook. The gap, at 2,400 feet of elevation, towered 500 feet over the land to its north, where Little Walker Creek cut through Walker Mountain, another defensible choke point. These gaps, however, may have been easy to flank, and were not selected for the main defense. The Ringgold artillery was first to arrive on the scene and instead deployed on the left side of the Dublin-Pearisburg Turnpike, along a ridge south of the mountain with good fields of fire for the guns. McCausland placed skirmishers at the gap but had the bulk of the infantry deploy in line with the artillery south of the mountain along gently sloping high ground 400 yards behind some steep bluffs. His intention may not have been so much to stop Crook, but rather to delay him, then withdraw. When Jenkins arrived on the morning of the 9th, he had a heated discussion with McCausland, and the infantry moved forward to the edge of the bluffs, a much better defensive position. By the morning of May 9, 1864, Jenkins had 2,400 men and 10 pieces of artillery in position. Crook was rushing south to meet him with 6,500 men and 12 pieces of artillery. This is a scan of a map used with permission from Howard McManus's book showing the Confederate position and the opening of the battle. Bryan's Confederate artillery dominated the left and center of the position with a clear field of fire. The 36th Va. was in reserve, while the Home Guard was in the center. 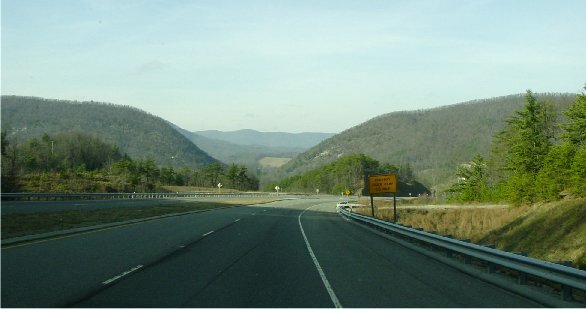 Connecting the Home Guard to the road was the 60th Va., while the right was protected by the 45th Va. and Beckley's Bn. This is a photograph from the Confederate center toward the hill occupied by Bryan's artillery on the left flank. Artillery on this hill dominated the center and left of the position. Crook flanked the skirmishers that had been placed on Cloyds Mountain, and could then see the imposing Confederate position down below. Crook wisely decided the best course of action would be to flank the Confederates on their right, so he ordered Col. White's Second Brigade to follow the lead of a local black guide. The Third Brigade would be on the Union right, near where the road emerges from the woods in the picture, and the First Brigade would be in the center, off the picture to the right. Col. White positioned his Second Brigade on the Confederate right flank and waited for the signal to attack which was to be three artillery shots. Crook, however, had ordered his artillery to move down the mountain and deploy in the field near the Third Brigade. This would distract attention for the coming infantry attack, but predictably, the Confederates won the artillery duel.